Somewhere between “bad hombre” and “nasty woman,” Republican presidential candidate Donald Trump made another statement Wednesday night that turned heads. He was nominally making a point about US economic growth, but many debate-watchers were wondering: Who exactly were these Indian representatives? It’s not immediately clear which “high representatives” he was referring to. But one theory picked up on in social media is that Trump was referring to an appearance he made on Saturday in Edison, New Jersey. He spoke to about 5,000 people at the New Jersey Convention and Exposition Center — an audience of mostly Indians and Indian Americans. The event was sponsored by the Republican Hindu Coalition, a new lobby on Capitol Hill, and was advertised as a Humanity United Against Terror Charity event. The proceeds were to benefit Hindu refugees and victims of terror in Bangladesh and Kashmir. 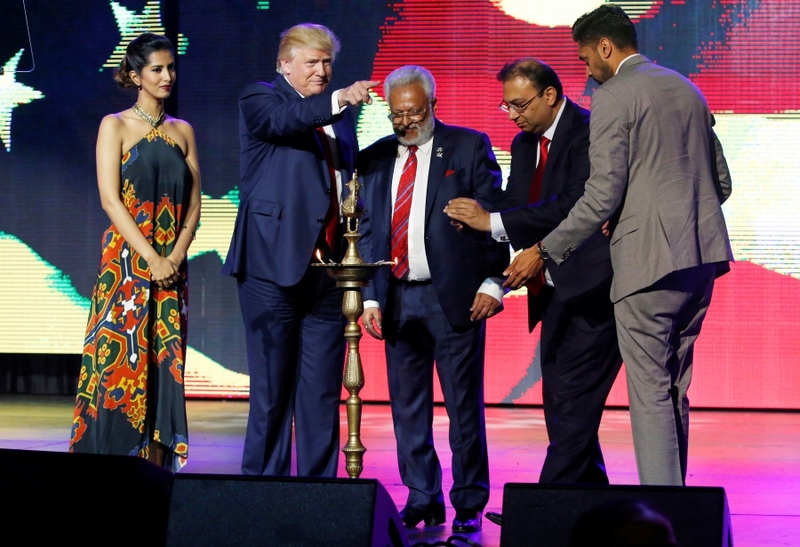 Before Trump’s appearance, there were performances by Bollywood stars like Malaika Arora Khan, as well as a skit in which dancing couples were attacked by “terrorists” wielding weapons of lightsabers. And when Trump finally appeared, he gave the crowd words to cheer for. The implication was that he would strengthen the alliance between the US and India. But he also may have very well been referring to the special relationship the Republican Party has established with the Hindus in India and America — a relationship which provided the backbone for Saturday night’s Bollywood/Tollywood concert. Shalabh Kumar, founder of the Republican Hindu Coalition told NDTV that the organization has donated about $1.5 million to Trump’s campaign. It’s the only explicitly political organization with “Hindu” in its name, and it’s modeled after the Republican Jewish Coalition. Kumar told reporters last fall that he was impressed with the way the Republican Jewish Coalition was able to influence a “conservative policy toward Israel” in US politics and that he wanted to do the same for India. Just as most Jewish people in the US are liberal, Indian Americans, too, lean left. The 2016 National Asian American Survey shows that 53 percent of Asian Indians identify with the Democratic Party, whereas only 7 percent think of themselves as Republican. A Pew Research study shows that the views of Americans who are Hindus follow similar patterns: Only 13 percent identify with or lean toward the Republican Party, while 61 percent align with the Democratic Party. Given the context, the Republican Hindu Coalition doesn’t necessarily represent the views of most Indian or Hindu Americans. In his pitch to the crowd, though, Kumar insisted that conservative values are Hindu values. The crowd booed at Kumar’s statements. That Kumar capitalized on the tense relationship between India and Pakistan — and by extension, between Hindus and Muslims — is why many critics say the Republican Hindu Coalition and groups like Hindus For Trump ignite nationalist feelings. In India, Hindu nationalism refers to the political ideology that all Indians were once Hindu, and that the ancient civilization of the Indian subcontinent — which includes modern-day countries like Bangladesh and Pakistan — was always a Hindu civilization. The near universal substitution of “Hindu” for “Indian” and vice versa during the event also pushes this ideology, even if it was a matter of convenience or laziness. India is a Hindu-majority country, but only about half of Indian Americans identify as Hindu, according to the Pew Research Center. Right-wing political leaders in India are often accused of polarizing communities with fiery rhetoric during election seasons. But most of the attendees at the Bollywood-themed concert in New Jersey didn’t read too much into the parallels: South Indian dancing star Prabhu Deva’s wicked moves took center stage. Mansi Choksi and Sonia Paul’s reporting was funded by a grant from the South Asian Journalists Association. This piece originally published on October 20, 2016, on PRI’s The World.